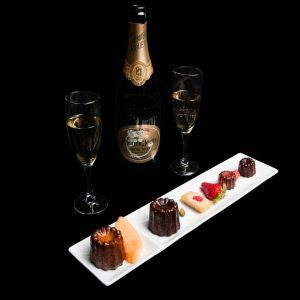 Canelé is a traditional pastry from Bordeaux with a crispy caramelized crust over a moist and tender custard center, tasting like a crème brûlée. In the 17th century, the nuns of the Covent of the Annunciation in Bordeaux (South West of France) started baking little pastries by using donated eggs yolks from local wine makers who clarified their wines with the egg whites. These extraordinary little confections made from simple ingredients were offered to the poor children. The Canelé (Kah-nuh-leh) was born. A century later, the recipe was fine-tuned with rum and vanilla beans and became a gourmet pastry traveling to Paris and other main cities in France. Where to find our delicious, addicting canelés?